USD 497 Superintendent Anthony Lewis speaks at the Community Conversation meeting in the Lawrence High cafeteria on Feb. 21. The meeting collected perspectives from the community regarding school safety and provided information on how to be a smart gun owner. 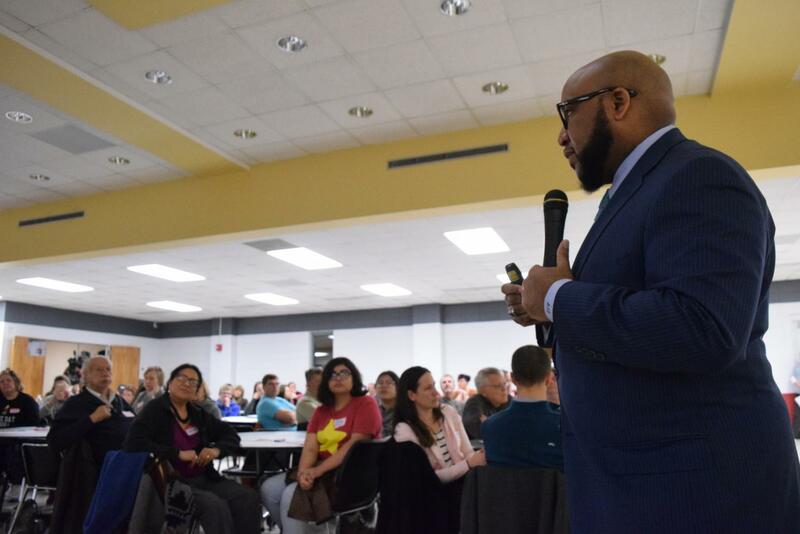 Lewis will lead the next community conversation on March 26 at Free State High School. Three incidents of students bringing weapons onto Lawrence High’s campus and at least two threats of violence have been investigated since the start of February, and state and school board policy dictate how administrators respond. The consequence for bringing a weapon on campus, as outlined in state statute KSA 72-6132, is a one-calendar-year expulsion from school. Though the state doesn’t allow school boards to have policies varying the punishment, the superintendent is allowed to adjust punishment in special situations. Many students, when asked, didn’t know the punishment for bringing a weapon on campus. “I feel like that’s something I should know and should all be aware of just so we know what’s going on,” senior and SAFER member Julian Weslander said. Some support changing the policy all together. Another student suggested continuously monitoring a student who has brought a weapon on campus after their return to school. “They should be monitored after [bringing a weapon] for safety purposes for all of the students,” junior Jasper Mumford said. Others, still, have expressed dissatisfaction with how administrators handle communication when these events occur. “I think we should know about it right when it’s happening, not an hour later,” freshman Ali Jones said. Lewis is hoping for communication between administrators and students to be quicker in the future. If an administrator does not follow policies, a supervisor will investigate and consult the superintendent about appropriate next steps. Associate principal Margene Brohammer cites board policy regarding weapons, which can be found in the student code of conduct. The best way to ensure everyone’s immediate safety, school board president Jessica Beeson said, is to practice safety with and around guns.